Love Walked In: When Martin Grace enters the hip Philadelphia coffee shop Cornelia Brown manages, her life changes forever. But little does she know that her newfound love is only the harbinger of greater changes to come. Meanwhile, across town, Clare Hobbs—eleven years old and abandoned by her erratic mother—goes looking for her lost father. She crosses paths with Cornelia while meeting with him at the café, and the two women form an improbable friendship that carries them through the unpredictable currents of love and life. Belong to Me: Cornelia Brown surprised herself when she was gripped by the sudden, inescapable desire to move to the suburbs with her husband. Her mettle is quickly tested by her impeccably dressed, overly judgmental neighbor Piper Truitt—the embodiment of everything Cornelia feared she'd find in suburbia. With Lake, another recent arrival, Cornelia shares a love of literature and old movies—as she forms an instant bond with this warm yet elusive woman and her perceptive, brilliant young son Dev. 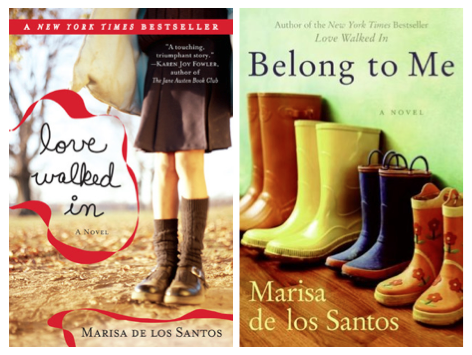 I read Love Walked In last year, and I actually included it on my list of favorite reads from 2011. After finishing it, I immediately went out and bought Belong to Me since I knew that it was a sort-of sequel. But I never quite got around to reading it. When I was finally ready to pick it up, the first book wasn't as clear in my mind as I would have liked so I did a little re-read. My favorite thing about Marisa de los Santos is her lyrical writing. She was a poet long before she was writing novels, and I think that's so evident in her books. The words just flow off the page, and there were so many things I wanted to underline and save to roll around in my mind later. Love Walked In revolves around the unlikely relationship between its two narrators, Cornelia and Clare. Cornelia is a cafe manger in her thirties who meets Clare, the 11-year-old daughter of her boyfriend, one day in the cafe. What happens next is a sweet love story - between a grown woman and a lost and scared little girl. I adored these two ladies, especially for the movie and literary references that are so intrinsic to their characters. They absolutely sold me on this book! In Belong to Me, Cornelia has the urge to move to the suburbs with her husband (I won't share his name because it would spoil part of the first book). Once she's finally moved in, she struggles to make friends and adjust to her new way of life. From her judgmental neighbor to a possible friend with lots of secrets, Cornelia is about to learn that things aren't always what they seem. You don't have to read the first book to understand the second, but I don't think you'll love the characters nearly enough without the history of the first book. This is a quiet book that focuses on character development and gorgeous prose. If you're interested a book with lots of heart, this is certainly one you should check out! "We talked and talked and talked. Maybe love comes in at the eyes, but not nearly as much as it comes in at the ears, at least in my experience. As we talked, lights flicked on inside my head; by the end of the night I was a planetarium." "Certain people are like that, I guess. They're together no matter where they are. They just belong to each other." I picked up Falling Together, too, but I haven't read it yet. I decided to save it for a while after I finished these two. I haven't heard great things about it, so I'm trying to have realistic expectations. Can't wait to see what you think if you get to it before I do! These are two of my FAVORITE books. I'm so glad you liked them too. I bought them/read them awhile ago, btu I still have them in my bookshelf. I think it deserves a re-read for sure. Yay for re-reading! I love to revisit old favorites, and I'm so glad that I've reminded you of these :) Hope you get a chance to spend some time with them soon. Both beautiful quotes. I've been meaning to try both of these actually. There were SO many things I could have quoted, which I think says a lot about the writing. Hope you read them soon - I think you'll really enjoy them! Oh these books sound like lovely comfort reads, and I love love when books are well written with spoonworthy delicious prose. My TBR is miles long, but I'll be adding these two! I know my TBR is long, but I'd be willing to bet yours is even more intimidating :) Even still, I'm so happy that you'll keep these in mind for the future. They really are lovely reads! Hope you enjoy if you get a chance to read them. I just threw these on my to-read. I've seen this author's name but never read her books! Hopefully in 2013! Also, these covers are SO PRETTY. Thanks for putting these on my radar! Love the sidetrack :) My mind works that way, too. And yay for adding them to your TBR! That makes me so happy & I'm so glad I got to put them on your radar. Hope you enjoy them!